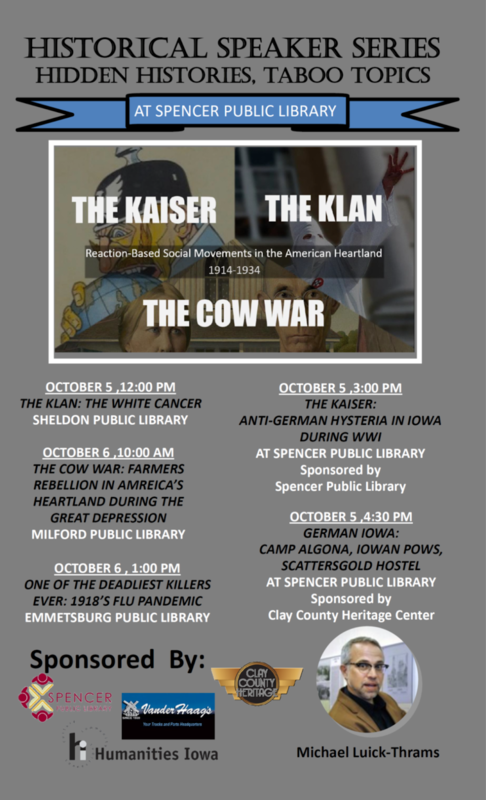 Friday, October 5 from 3:00-6:00 PM – Kickin’ the Kaiser and German Iowa at Spencer Public Library– Spencer Public Library and the Clay County Heritage Center will host presentations by historian, Michael Luick-Thrams. “Kickin’ the Kaiser” and “German Iowa” both at Spencer Public Library. First, we will examine the anti-German hysteria that plagued the U.S. and Iowa during WWI and then we will expand to larger questions of Iowans’ relationships with Germans, Germany, and things Germanic. Free to the public. Snacks provided! Sponsored by Humanities Iowa and Vander Haag’s Inc. Call the library 580-7290 or Clay County Heritage Center 262-3304 for more information. Friday, October 11 @ 1:00 PM – Civilian Conservation Corp in Iowa at Spencer Public Library – Join historical speaker, Linda Betsinger McCann at Spencer Public Library as she shares the stories of 20 men who were in the CCC. The CCC was a federal program to assist young men in supporting their families during the Depression years. Free to the public. Call 580-7290 for more information. Monday, October 15 @ 6:30 PM – Movie at Spencer Public Library – Won’t You Be My Neighbor –The Library will show the documentary movie, Won’t You Be My Neighbor, about the loveable television personality Fred Rodgers of Mr. Rodgers Neighborhood. Free popcorn, soda, and candy. Free to the public - call 580-7290 to reserve your spot! Friday, October 19 @ 6:00 PM – Kathy Wilson at Spencer Public Library – Death Comes for Us All: Death and Morning in the Victorian Era - Victorians had a different attitude about death than we do in the 21st Century. People died at home surrounded by loved ones, families picnicked in cemeteries on Sundays, took photos with deceased, and made jewelry from their hair. Historian Kathy Wilson will explore the Victorians’ fascination with death & the culture they developed to memorialize the dead. Free to the public. Call 580-7290 for more information. Monday, October 29 @ 6:30 PM – Banned Book To Movie at Spencer Public Library – Of Mice and Men - In honor of Banned Books Week, September 23-29, we will read one of the most banned books in America, Of Mice and Men, by John Steinbeck. We will watch and discuss both the book and the movie, starring John Malkovich and Gary Sinise, on October 29. Please register to check-out a book and reserve your spot at the movie 580-7290. Free popcorn, soda, and candy.